2. Admire the Petronas Towers from the outside. 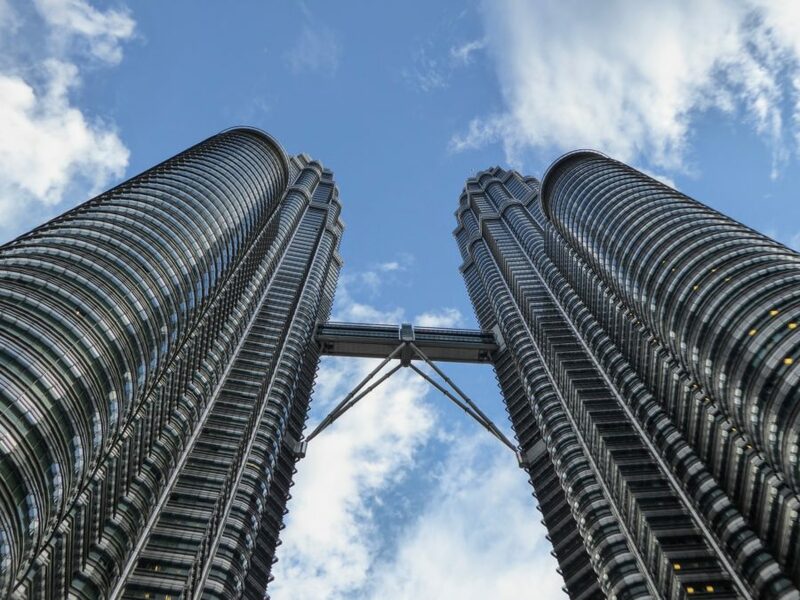 The Petronas Towers used to be the tallest buildings in the world However after being overtaken by Tapei 101 they are now the tallest twin towers standing at 452 metres high. It is not just one of the free things to do in Kuala Lumpur, but they are also a must when you visit the city. Impressive by day, they get even better at night when they are illuminated. 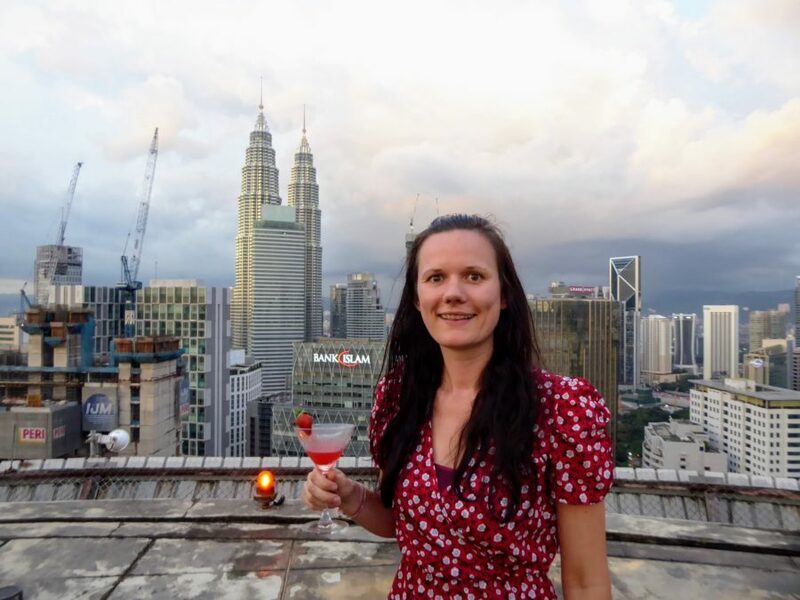 They are a costly 80MYR to go up therefore I would recommend going to Heli bar (a bar on a helicopter pad with great views of KL) and purchasing a 30MYR cocktail to enjoy views of Kuala Lumpur which include the Petronas Tower on the skyline. The Petronas Towers are located right next to KLCC park. 3. Watch the KLCC Lake Symphony show. 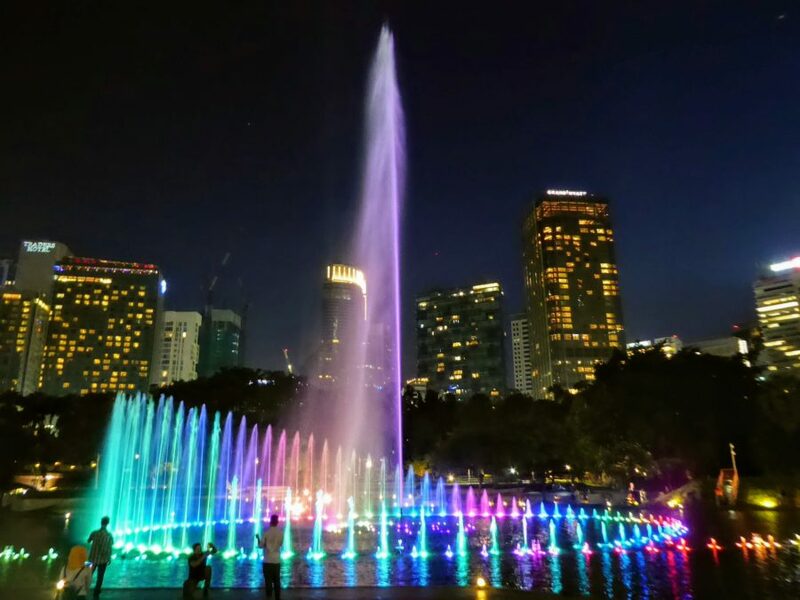 In front of Suria KLCC / Petronas Towers each evening at 7pm the fountains become alive with colour and dance to the sound of music. Don’t stand too close to the edge though as you may get a little wet as the fountains lean towards you. 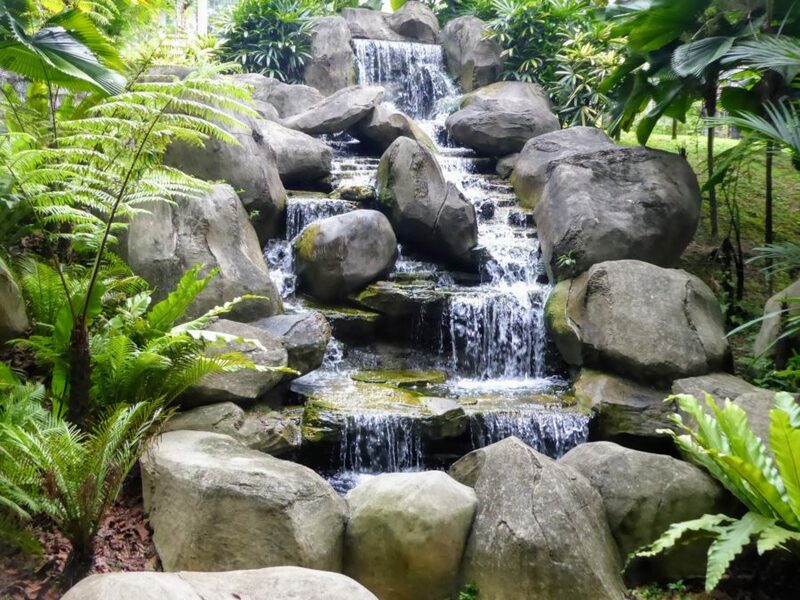 Officially known as Perdana Botanical Gardens, it is a beautiful 200 acre park surrounding a lake. This landscaped area is great for cycling and wandering around. It also has a great little WiFi hotspot point and lots of private sitting areas. Within the grounds are an observatory, a free small deer park, botanical gardens, children’s play area and a bird park. 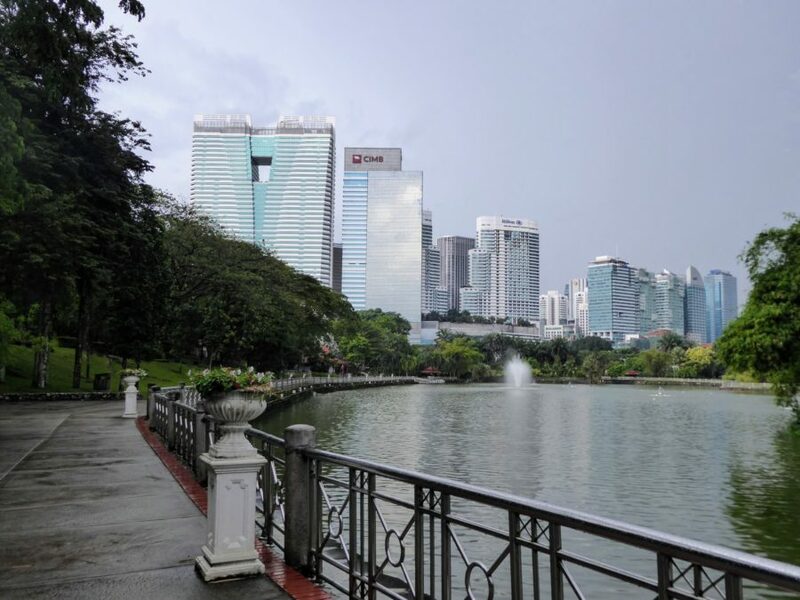 Taman Tasik Perdana is a 10 minute walk from Chinatown and close to KL Dental. 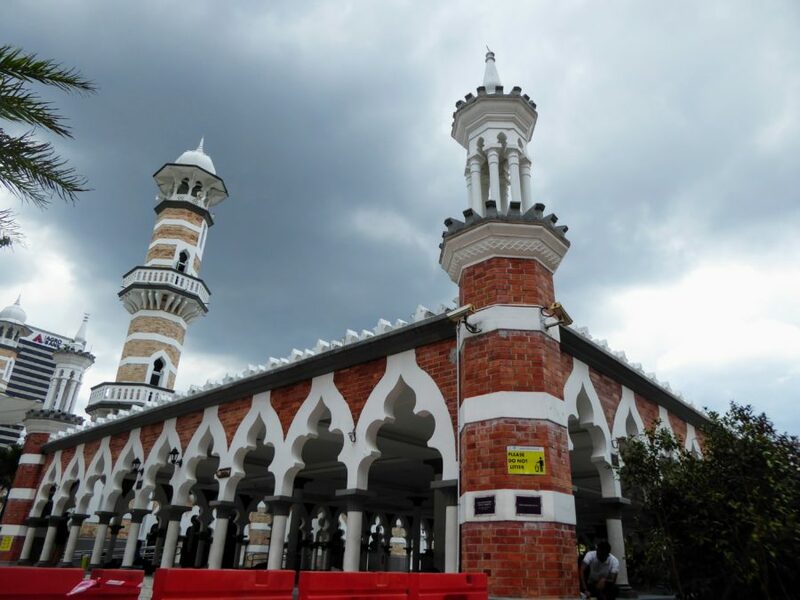 Masjid Jamek mosque is an important landmark of Kuala Lumpur. With its Indo Saracenic design, surrounded by palm trees, it is very photogenic. You need to dress modestly and remove your shoes before entering. It is closed to tourists during certain times to allow for prayers to be carried out in peace. Free walking tours are run by the city council. Visit visitkl.gov.my to book yourself into one. This is one of the Free things to do in Kuala Lumpur that you cannot miss. 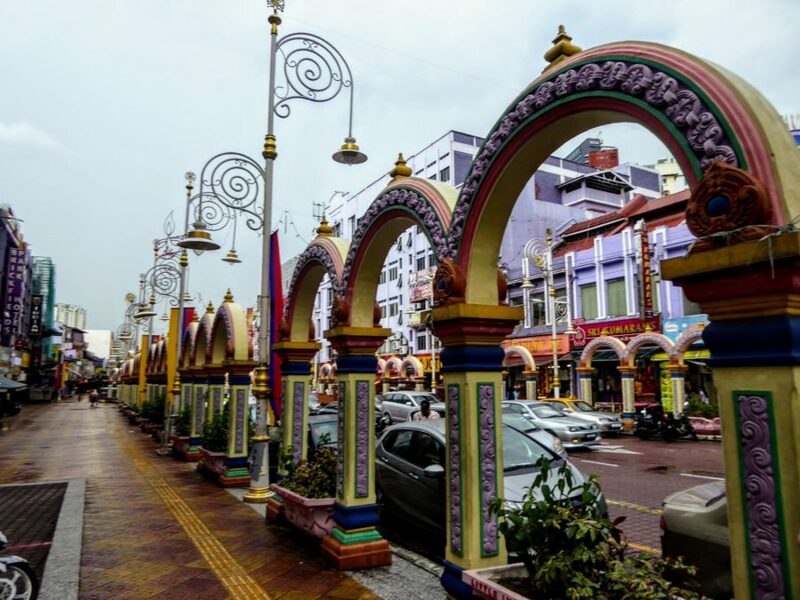 They cover the main areas of Kuala Lumpur and give additional information about the history of the city. It is a great way of meeting new people. See my post about making friends on the road. Don’t forget to tip your guide at the end. The Batu caves are in limestone and are home to one of the most famous Hindu shrines outside India. It is surrounded by monkeys and has lots of other shrines and caves nearby. You are also allowed to rock climb here with lots of different routes. Check out my post about the Batu Caves here. Everyone loves a photo opportunity such as an I love [insert current city here] sign. A definite must for social media to prove you have been to a city. 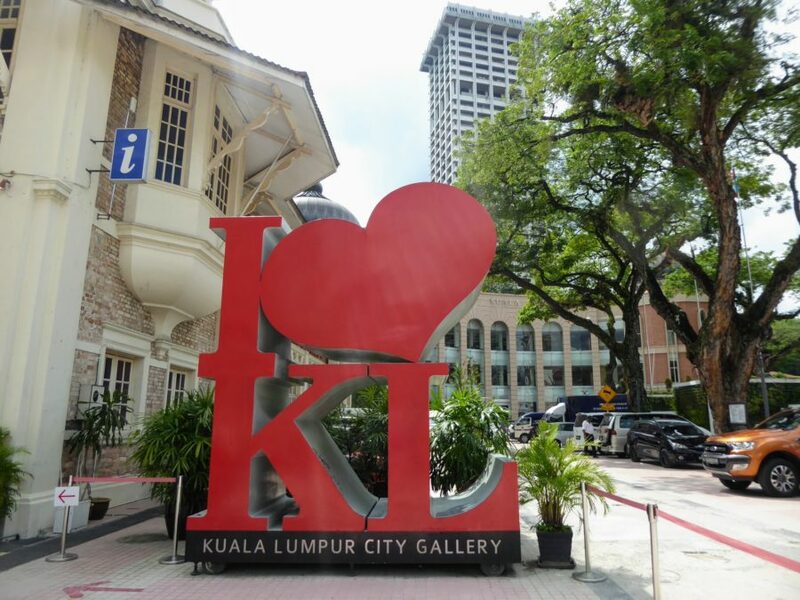 Next to Kuala Lumpur City Gallery you can find just that sign. However to enter the Gallery you have to pay. 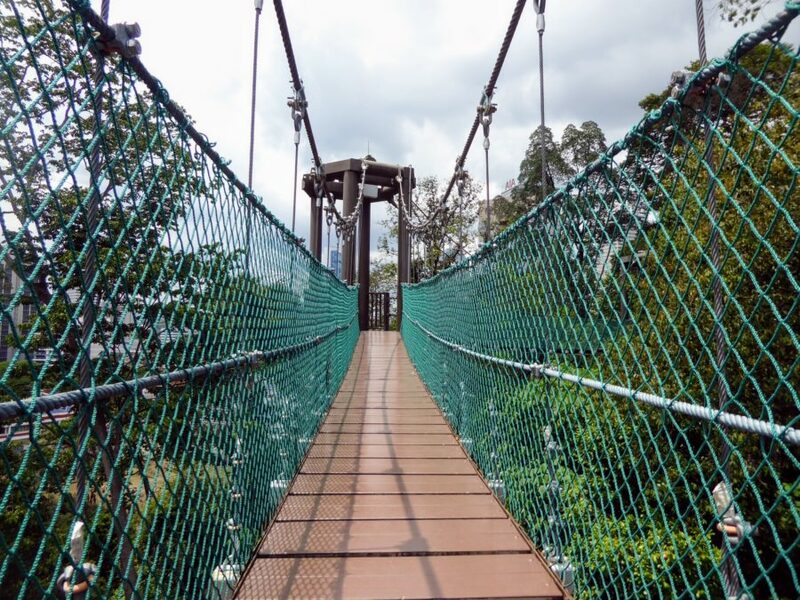 In the tree tops of the KL Forest Eco Park is a set of rope bridges taking you along the tree line. It shows off amazingly the contrast of the 9 hectares of forest against the towering skyscrapers and Menara Tower. Check out my post on the rope walkways to find out more. Each Sunday the roads are closed to cars at Publika, Solaris Dutamas from 7am – 10am. 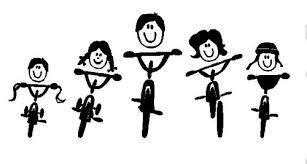 Although called Wheelie Sunday you do not just have to cycle. You can walk, jog and skate the 1.2km route. Don’t worry if you don’t have your own bike. They have free bikes at The Square, Publika. 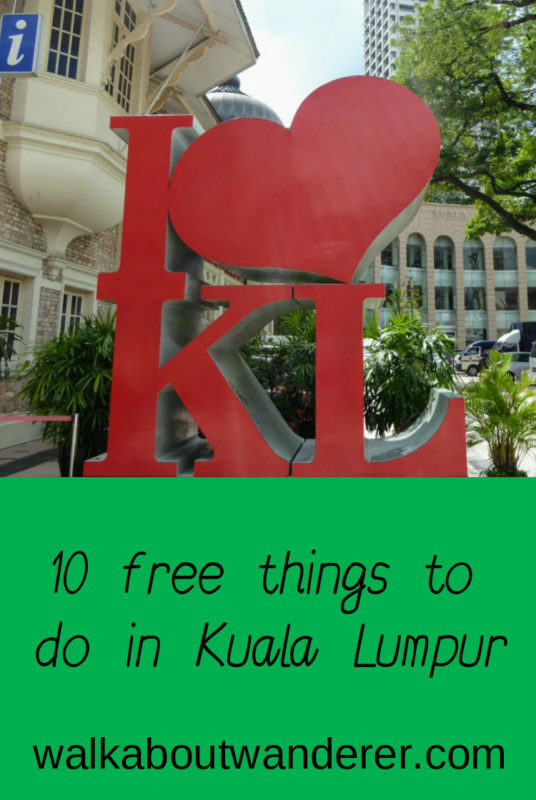 So there you have it, my top 10 free things to do in Kuala Lumpur. 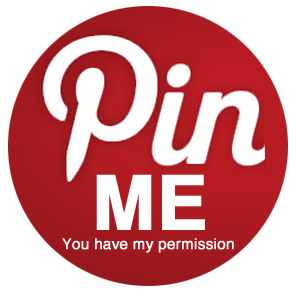 If you have any recommendations please do not hesitate to comment below. And don’t forget to subscribe to my blog (It’s free) for updates, adventurous stories and money saving tips. Looking for more things to do in Kuala Lumpur then check out these 25 things to do and this budget 48 hour guide. Hi Kathy, great list and article! Having been to KL several times myself you’ve even suggested one or two things I haven’t tried myself so that’s amazing, and will definitely try the canopy walkway next time! This place is just next to my home country, but I haven’t visited. I should visit and experience Kuala Lumpur by my own. Kuala Lumpur seems to have many free options to enjoy and especially active. I love the idea of the Wheelie Sunday idea. Every city needs to close roads and have a day of active transportation. It’s great for the environment and our sanity! Wheelie Sunday – what a great initiative! Awesome to get people out and about on their bikes. 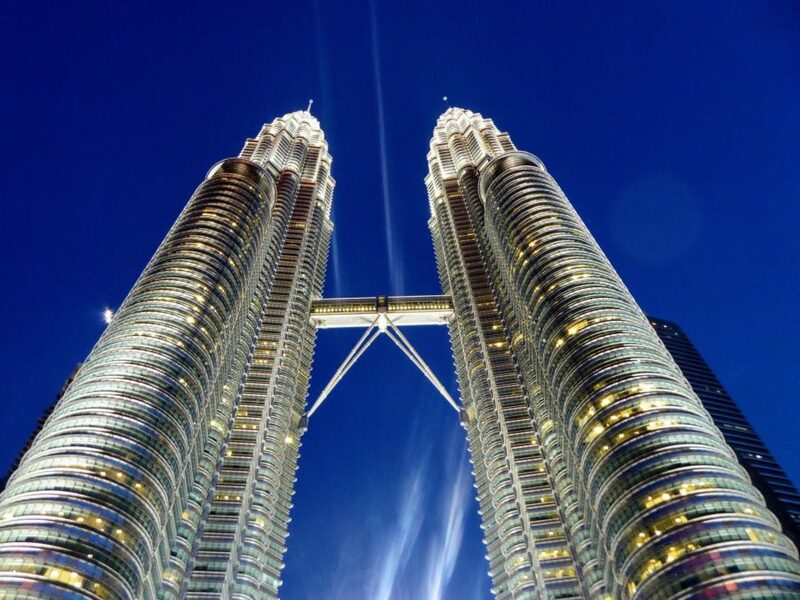 The Petronas Towers are spectacular – I visited them some years ago and thought they were quite magnificent – I wish I had been able to capture them at the time with a better camera that was wide enough to get the whole shot! 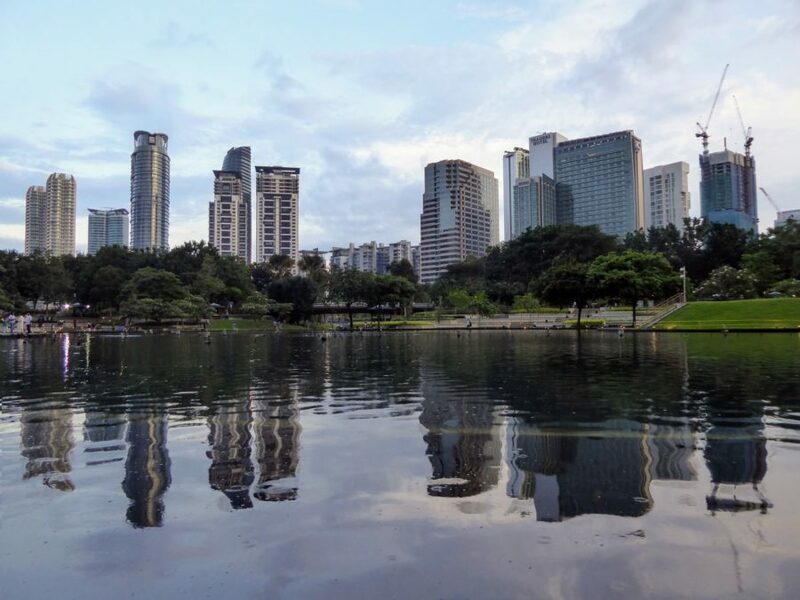 KL is a great stopover destination for many places so it makes sense to get out and enjoy the free things to do while on a layover in particular.